The paper "A Reference Model for Learning Analytics" has been published in the International Journal of Technology Enhanced Learning (Vol. 4, Nos. 5/6). The paper can be downloaded here. 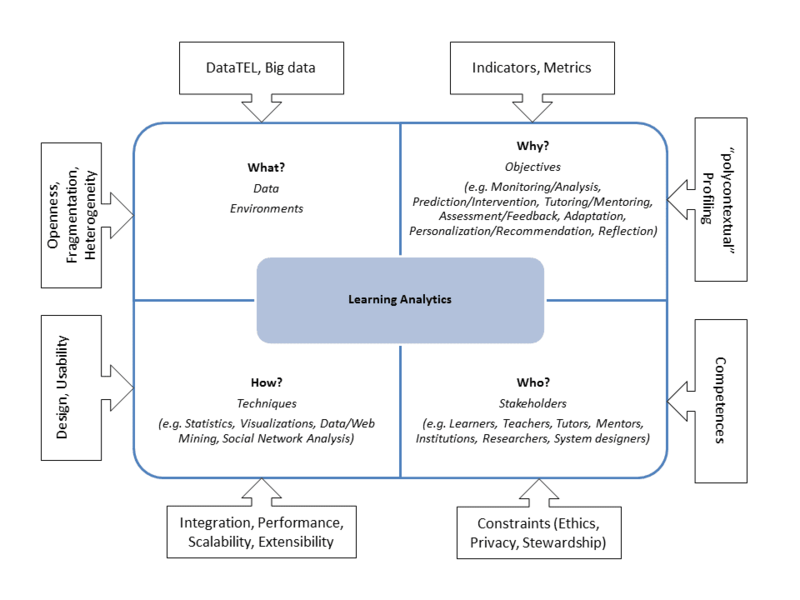 An updated version of the LA reference model as well as an overview of future perspectives in the LA research field are available in the paper "Learning Analytics: Challenges and Future Research Directions". Recently, there is an increasing interest in learning analytics in Technology-Enhanced Learning (TEL). Generally, learning analytics deals with the development of methods that harness educational datasets to support the learning process. Learning analytics (LA) is a multi-disciplinary field involving machine learning, artificial intelligence, information retrieval, statistics and visualisation. LA is also a field in which several related areas of research in TEL converge. These include academic analytics, action analytics and educational data mining. In this paper, we investigate the connections between LA and these related fields. We describe a reference model for LA based on four dimensions, namely data and environments (what? ), stakeholders (who? ), objectives (why?) and methods (how?). We then review recent publications on LA and its related fields and map them to the four dimensions of the reference model. Furthermore, we identify various challenges and research opportunities in the area of LA in relation to each dimension. 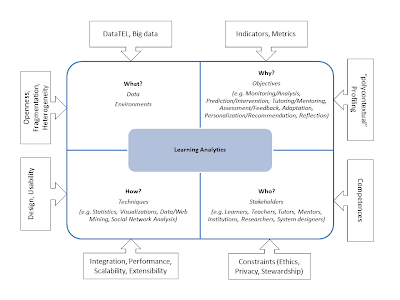 Chatti, M.A., Dyckhoff, A.L., Schroeder, U. and Thüs, H. (2012) ‘A reference model for learning analytics’, Int. J. Technology Enhanced Learning, Vol. 4, Nos. 5/6, pp.318–331. Chatti, M. A. (2010). The LaaN Theory. In Personalization in Technology Enhanced Learning: A Social Software Perspective (pp. 19-42). Aachen, Germany: Shaker Verlag. One of the core issues in Technology Enhanced Learning (TEL) is the personalization of the learning experience. This implies a need for new TEL models that start from the learners and satisfy their unique needs in order to achieve a personalized learning experience for everyone. This paper discusses the Learning as a Network (LaaN) theory as a theoretical foundation for self-organized and networked learning models. LaaN builds upon connectivism, complexity theory, and double-loop learning. It promotes a theory of change, movement, dynamism, self-organization, emergence, and effectiveness, which puts the learner at the center and represents a knowledge ecological approach to learning. In many ways, LaaN overlaps with other learning theories; yet it is distinctive enough to be treated as a separate perspective on learning. While pedagogical and technological aspects of PLEs and cMOOCs are increasingly discussed in the TEL literature, the discussion of a theoretical framework for these concepts lacks behind. This missing theoretical framework hinders PLEs and cMOOCs from being more widely understood and adopted. This paper discusses the Learning as a Network (LaaN) theory as a theoretical foundation for self-organized and networked learning models. We start with a brief introduction of connectivism, complexity theory, and double-loop learning, which build the backbone for LaaN. We then provide a detailed discussion of the key characteristics of LaaN that distinguish it from dominant learning and social theories. These theories are behaviorism, cognitivism, (social) constructivism, situated learning, activity theory, and actor-network theory. Siemens (2005) argues that knowledge and learning are today defined by connections. The author stresses that “know where” and “know who” are more important today that "knowing what" and "how", and introduces connectivism as a new learning theory that presents learning as a connection/network-forming process. He suggests that learning which resides outside the individual learner is focused on connecting specialized information sets and the connections that enable us to learn more than our current state of knowing. According Siemens, the main intent of network creation is to enable learners to continue to stay current in the face of rapidly developing knowledge. He further points out that the half-life of knowledge is shrinking and argues that learning networks can resolve some of the challenges of the rapidly diminishing half-life of knowledge. Connectivism is also the assertion that “the pipe is more important than the content within the pipe” (Siemens, 2005). That is, the connections that enable us to learn are more important than our current state of knowing. As the author puts it: “Our ability to learn what we need for tomorrow is more important than what we know today [...] As knowledge continues to grow and evolve, access to what is needed is more important than what the learner currently possesses”. A similar view of connectivism is provided by Downes (2007) who writes: “At its heart, connectivism is the thesis that knowledge is distributed across a network of connections, and therefore that learning consists of the ability to construct and traverse those networks”. Complexity theory refers to the study of complex systems. A complex system is an open, dynamic, and constantly evolving network of many interacting identities, where the behavior of the whole is far more complex than the individual behavior of the parts. The term complex adaptive systems (CAS), or complexity science, is often used to describe the academic field that has grown up around the study of complex systems. Complex adaptive systems are special cases where a complex, non-linear, interactive system has the ability to learn from and adapt to a constantly changing environment (Holland, 1992, 1995). Emergence is central to the theory of complex adaptive systems (Holland, 1998). The term “emergent” was coined by the pioneer psychologist G. H. Lewes in 1875, who wrote "The emergent is unlike its components in so far as these are incommensurable, and it cannot be reduced to their sum or their difference" (Lewes, 1875, p. 413) (as cited in Corning, 2002). A more recent definition of emergence was provided by Goldstein (1999) who refers to “the arising of novel and coherent structures, patterns and properties during the process of self-organization in complex systems” (p. 49). Holland (1998) stresses that emergence must be the product of self-organization, not centralized control (as cited in Ryan, 2007). · Simple, in which the relationship between cause and effect relationships is well known. · Complicated, in which the relationship between cause and effect is knowable but some effort is required in order to analyze the system. · Complex, in which the relationship between cause and effect are intertwined and cannot be known in advance. · Chaotic, in which there is no perceived relationship between cause and effect. The concept of double-loop learning was introduced by Argyris & Schön (1978) within an organizational learning context. According to the authors, organizational learning is the process of detecting and correcting errors. It takes account of the interplay between the actions and interactions of individuals and higher-level organizational entities such as departments, divisions, or groups of managers. Each member of an organization constructs his own representation of the theory-in-use of the whole. Organizational learning then occurs when individuals within an organization experience a problem (error detection) and work on solving this problem (error correction). Error correction happens through a continuous process of organizational inquiry, where everyone in the organizational environment can inquire, test, compare and adjust his theory-in-use, which is a private image of the organizational theory-in-use. Effective organizational inquiry then leads to a reframing of one’s theory-in-use, thereby changing the organizational theory-in-use. This deeper form of learning is what Argyris terms double-loop learning. To put it simply, single-loop learning differs from double-loop learning in that the former aims at efficiency (i.e. doing things right) and the latter focuses on effectiveness (i.e. doing the right things). Argyris & Schön (1996) define single-loop learning as "learning that changes strategies of actions or assumptions underlying strategies in ways that leave the values of a theory of action unchanged" (p. 20), and double-loop learning as "learning that results in a change in the values of theory-in-use, as well as in its strategies and assumptions" (p. 21). In other words, Argyris and Schön differentiate between learning that does not change the underlying mental models of the learners but merely revises their application scenarios (single-loop), and learning which does affect such changes (double-loop). Double-loop learning starts from a learner’s mental model (i.e. theory-in-use) defined by base norms, values, strategies, and assumptions, and suggests critical reflection in order to challenge, invalidate, or confirm the used theory-of-use. Double-loop learning also encourages genuine inquiry into and testing of one’s actions and requires self-criticism, i.e. the capacity for questioning one’s theory-in-use and openness to change the same as a function of learning. The result of reflection, inquiry, testing, and self-criticism would then be a reframing of one’s norms and values, and a restructuring of one’s strategies and assumptions, according to the new settings. The Learning as a Network (LaaN) theory draws together some of the concepts behind connectivism, complexity theory, and double-loop learning. An abstract view of LaaN is depicted in Figure 1. Connectivism focuses on making connections (at external, conceptual, and neural levels) and seeing patterns. However, it misses some of the double-loop learning concepts, which are crucial for learning, such as learning from failures, error detection and correction, and inquiry. On the other hand, double-loop learning aims at detecting and correcting errors by changing the values, strategies, and assumptions of the theory-in-use according to the new setting. Double-loop learning however, does not recognize the power of connections and networks that can help us operate in highly dynamic and uncertain knowledge environments, characterized by increasing complexity and fast-paced change. 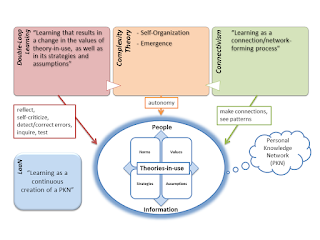 In LaaN, the result of learning is a restructuring of one’s PKN, that is, an extension of one’s external network with new knowledge nodes (external level) and a reframing of one’s theories-in-use (conceptual/internal level). · Create, harness, nurture, sustain, and widen her external network to embrace new knowledge nodes. · Identify connections, recognize patterns, and make sense between different knowledge nodes. · Locate the knowledge node that can help achieving better results, in a specific learning context. · Cross boundaries, connect, and cooperate. · Navigate and learn across multiple knowledge networks. · Help other knowledge networkers build and extend their networks. · Build her own representation of the theories-in-use of the whole. · Detect and correct errors with norms and values specified by the new setting. · Test, challenge, and eventually change her theories-in-use (i.e. her private image of the theories-in-use of the whole) according to the new setting. LaaN-based learning also implies new roles for the learning institution and the teacher. In LaaN, the learning institution needs to act as a hub connecting third parties providing personalized learning experiences to the learners. And, teachers need to step back from their traditional role of instructors and experts. The new role of the teachers is to act as co-learners and facilitators of the learning experience. Their major task is to help learners build their PKNs in an effective and efficient way, by providing a freeform and emergent environment conducive to networking, inquiry, and trial-and-error; that is an open environment in which learners can make connections, see patterns, reflect, (self)-criticize, detect and correct errors, inquire, test, challenge and eventually change their theories-in-use. At the heart of LaaN lie knowledge ecologies. A knowledge ecology is based on the concept of PKNs, loosely joined, and can be defined as a complex, knowledge intensive landscape that emerges from the bottom-up connection of PKNs. The definition of knowledge ecology is highly compatible with complexity theory. As with complex adaptive systems, a knowledge ecology holds emergent properties, includes self-organized entities, and can evolve in ways that we may not expect or predict. Knowledge ecologies blur the boundaries of learning and harness the power of PKNs. They house self-directed learning that occurs in a bottom-up and emergent manner, rather than learning that functions within a structured context, of an overarching framework, shaped by command and control. Based on the PKN and knowledge ecology concepts, the next sections outline the major differences between LaaN and different dominant learning and social theories. These theories are behaviorism, cognitivism, (social) constructivism, situated learning, activity theory, and actor-network theory. Learning has traditionally been the province of psychological theories: behaviorism, cognitivism, and constructivism (Wenger, 1998). Behaviorist theories focus on behavior modification via stimulus-response pairs and selective reinforcement (positive and negative reinforcement). Their pedagogical focus is on control and adaptive response (Skinner, 1974) (as cited in Wenger, 1998, p. 279). Behaviorists define learning as a change in behavior in the learner, and see the mind as a "black box" in the sense that all behavior can be explained without the need to consider internal mental states or consciousness. The goal of instruction for the behaviorist is to elicit the desired response from the learner who is presented with a target stimulus (Ertmer & Newby, 1993). Cognitive theories focus on internal cognitive or mental structures and view learning as the transformations that occur within them. They address the issues of how information is received, organized, stored, and retrieved by the mind (Ertmer & Newby, 1993). Unlike the behaviorists, who were only concerned with behavioral responses and what learners do, cognitivists are interested in what learners know and how they come to acquire knowledge (Jonassen, 1991). The goal of instruction for the cognitivist is to make knowledge meaningful and help learners organize and relate new information to existing knowledge in memory (Ertmer & Newby, 1993). The class of behaviorist and cognitivist learning theories has been referred to as objectivism (Jonassen, 1991). In the literature dealing with learning theories and instructional design, objectivism (i.e. behaviorism/cognitivism) has often been contrasted with constructivism, which holds that "knowing is a process of actively interpreting and constructing individual knowledge representations" (Jonassen, 1991, p. 5). Constructivist theories focus on the processes by which learners build their own mental structures when interacting with an environment. Their pedagogical focus is task-oriented. They favor hands-on, self-directed activities oriented toward design and discovery (Piaget, 1954; Papert, 1980) (as cited in Wenger, 1998, p. 279). Objectivism (i.e. behaviorism/cognitivism) and constructivism, as psychological theories, assume that learning occurs inside a person (Siemens, 2005a) and view knowledge as a property and possession of an individual mind. Sfard (1998) points out that the objectivist and constructivist processes can be conceptualized in terms of the acquisition metaphor, where learning is mainly a process of acquiring and accumulating desired pieces of knowledge. The author further notes: "The language of ’knowledge acquisition’ and ’concept development’ makes us think about the human mind as a container to be filled with certain materials and about the learner as becoming an owner of these materials" (Sfard, 1998, p. 5). Instead of knowledge residing only in the mind of an individual, LaaN focuses on knowledge as both intrinsic and extrinsic. In LaaN, knowledge does not only reside in the mind but also in a distributed manner across a network (Downes, 2007, Siemens, 2005). In other words, psychological theories emphasize knowledge as a thing/object that can be acquired or constructed, and the individual mind as a container, whereas LaaN emphasizes knowledge as a personal network, which provides the learner with the means needed to deal with ill-structured topics/problems and to explore complex knowledge environments. In LaaN, learning is learner-initiated knowledge networking rather than knowledge acquisition, internalization, or construction. LaaN shares a core proposition with dominant social theories, such as social constructivism, situated learning, activity theory, and actor-network theory in that knowledge and learning are fundamentally social in nature. However, the LaaN view of learning as a continuous creation of a PKN is quite distinctive. Social Constructivism is a theory of learning based upon the learners’ social interaction and collaboration. Social constructivist theorists (e.g. Vygotsky) have extended the traditional focus on individual learning to address collaborative and social dimensions of learning. Whereas Piaget’s cognitive constructivism focuses on the individual mind, Vygotsky’s social constructivism conceptualizes learning as more socially constructed. A central concept in Vygotsky’s social constructivism is the ’zone of proximal development’ (ZPD), which highlights the potential for future learning which can be achieved with appropriate support. Vygotsky (1978) distinguishes between two developmental levels: The level of actual development is the level of development that the learner has already reached, and is the level at which the learner is capable of solving problems independently. The level of potential development is the level of development that the learner is capable of reaching under the guidance of teachers or in collaboration with peers. The learner is capable of solving problems and understanding material at this level that they are not capable of solving or understanding at their level of actual development. Vygotsky (1978) further defines the zone of proximal development (ZPD) as "the distance between the actual developmental level as determined by independent problem solving and the level of potential development as determined through problem solving under adult guidance or in collaboration with more capable peers" (p. 86). LaaN differs from social constructivism in four different ways. First, the theory of social constructivism suggests that learners co-construct knowledge. However, the usage of the word “construction” implies that knowledge is a robust and durable object. As Latour (2005) states: "using the word ’construction’ seemed at first ideal to describe a more realistic version of what it is for anything to stand. And indeed, in all domains, to say that something is constructed has always been associated with an appreciation of its robustness, quality, style, durability, worth, etc" (p. 89). Robustness and durability however, do not apply to knowledge. Knowledge is much more varied and uncertain. As Siemens (2005) stresses: “In today’s world, knowledge life is short; it survives only a short period of time before it is outdated”. In LaaN, knowledge is a personal network rather than an object that can be constructed. Second, although social constructivism takes social interactions into account, it still sees learning as essentially intrinsic (i.e. in the learner’s mind). In fact, the primary focus of Vygotsky’s social constructivism is to determine the state of a learner’s mental development by clarifying its two levels: the actual developmental level and the ZPD. The actual developmental level of a learner indicates her actual mental abilities and the ZPD represents her potential mental development. As Vygotsky (1978) puts it: "The actual developmental level characterizes mental development retrospectively, while the zone of proximal development characterizes mental development prospectively" (p. 86). The focus on the mental development of the learner makes thus from social constructivism a learning theory with a primarily psychological perspective. Unlike social constructivism, which views learning as internal developmental processes that result in mental development (i.e. intrinsic), LaaN views learning as both intrinsic and extrinsic; it occurs through the continuous building of personal knowledge networks, at both internal/conceptual and external levels. Third, Vygotsky’s social constructivism has centered on the role that adults play in fostering children’s development. ZPD, which is closely related to the concept of "scaffolding", emphasizes that learning occurs best when an expert (either an adult or a more competent peer; aka the More Knowledgeable Other, MKO) guides a novice from their current level of knowledge to the level of knowledge they are capable of with assistance. However, nowadays the lines became blurred between the expert and novice roles. At each moment the novice can move into the expert role and vice versa. In LaaN, everyone is a knowledge networker and can thus act as a novice in one context and step into the expert role in another context. The bridge between where the learner is and where she is going is through her personal knowledge network, rather than in the hands of a teacher or a more competent peer. Fourth, the notion of ZPD enables learning, which is oriented towards a level of potential development, embodied in the adult or more competent peer. Knowledge however, is complex and the level of potential development can thus never be anticipated or predicted. In LaaN, learning takes place in a knowledge ecology rather than within a ZPD. Unlike a ZPD which is characterized by a rigid, restrictive, and unidirectional development (i.e. training the novices within the ZPD towards a level of potential development), a knowledge ecology is open, multidirectional, and without an end point of development. The boundaries of knowledge ecologies are less fixed and can easily be bridged and merged. And, the development within a knowledge ecology is never fully predetermined and occurs in unpredictable directions. Situated learning is a model of learning first introduced by Jean Lave and Etienne Wenger in 1991. This model proposes that knowing and learning involve a process of engagement in a community of practice (CoP). As Lave & Wenger (1991) write: "Knowing is inherent in the growth and transformation of identities and it is located in relations among practitioners, their practice, the artifacts of that practice, and the social organization … of communities of practice" (p. 122). Rather than looking to learning as the acquisition of certain forms of knowledge, Lave & Wenger (1991) explore the participation metaphor of learning in which learning is a matter of legitimate peripheral participation (LPP) within a CoP. According to Lave and Wenger, in a CoP, a newcomer learns from old-timers through participating in certain tasks that relate to the practice of the community. Over time the newcomer moves from peripheral to full participation. Wenger (1998) revised his earlier work (Lave & Wenger, 1991) to offer a social account of learning through the negotiation of meaning and identity formation within CoPs. While Wenger does not ignore legitimacy and peripherality, it is participation that he extracts as being crucial to the revised notion of a CoP showing it to be the key constituent in the processes of the negotiation of meaning. According to Wenger (1998), participation refers to "a process of taking part and also to the relations with others that reflect this process. It suggests both action and connection" (p. 55). Wenger stresses that learning is social participation. He further explains that any CoP will then produce artifacts, which reify some aspect of its practice, and refers to this process of giving form to the experience as reification. Within LaaN, the notion of legitimate peripheral participation (LPP) - which is very close to Vygotsky’s ZPD - is absent. In LaaN, role models are not strictly defined. There is no distinction between "newcomers, novices, or peripheral participants" and "old-timers or masters". Every participant is equally treated as a knowledge networker. Unlike CoPs, which are characterized by a single movement from the periphery to the center, in a knowledge ecology, the center does not hold and the movements occur in unpredictable directions. Communities of Practice presents a theory of learning that starts with this assumption: engagement in social practice is the fundamental process by which we learn and so become who we are. The primary unit of analysis is neither the individual nor social institutions but rather the informal "communities of practice" that people form as they pursue shared enterprises over time. In LaaN, by contrast, the primary focus is on the individual learner and her PKN. Knowledge development in LaaN is driven by the learning demands of the learner, rather than the community in which she belongs. In contrast to Wenger’s learning theory, where learning for an individual is "an issue of engaging in and contributing to the practices of their communities" (p. 7), LaaN views learning for an individual as an issue of continuously building, maintaining, extending, and restructuring her PKN. Furthermore, the social landscape is quite different within LaaN. A strong distinction can be made between closed, bounded, structured, and hierarchical CoPs on the one hand and open, distributed, diverse, emergent, and self-controlled knowledge ecologies on the other hand. A knowledge ecology differs from a CoP on all these dimensions. Wenger states that "the second characteristic of practice as a source of community coherence is the negotiation of a joint enterprise" (p. 77). According to Wenger, a CoP involves organizing around some particular area of knowledge (i.e. a shared domain of interest) that gives members a sense of joint enterprise and shared identity. Membership in a CoP implies a commitment to the domain and a continuous negotiation of a joint enterprise. A CoP is thus a homogeneous social entity consisting of members with a joint enterprise and a shared domain of interest. Unlike CoPs, knowledge ecologies are not bound by a shared practice, a joint enterprise, or an overarching domain. They are open, flexible, heterogeneous, and multidisciplinary social entities. In a knowledge ecology, people continuously create their PKNs which shape their identity and knowledge home, rather than create a shared identity through engaging in and contributing to the practices of a CoP. Wenger further notes that "communities of practice are not self-contained entities. They develop in larger contexts - historical, social, cultural, and institutional - with specific resources and constraints" (p. 79). Consequently, the practice of a community is profoundly shaped by conditions outside the control of its members due to external efforts to maintain influence and control over the practice. In contrast to CoPs, knowledge ecologies are not positioned within a broader system and are not bound to the control of any external force. They emerge naturally without strong predetermined rules or external authority. Knowledge ecologies are thus self-controlled and self-contained entities. The cultural-historical theory of activity (Activity Theory) has grown out of the work of Vygotsky, Leont’ev and other Soviet socio-cultural oriented psychologists. Activity Theory approaches human cognition and behavior as embedded in collectively organized, artifact-mediated and object-oriented activity systems (Vygotsky, 1978; Leont’ev, 1978; Engeström, 1987). According to Engeström (1999b), an activity system "constantly generates actions through which the object of the activity is enacted and reconstructed in specific forms and contents - but being a horizon, the object is never fully reached or conquered" (p. 381). Activity Theory develops from the work of Vygotsky, particularly his arguments that human development and learning is mediated by artifacts, such as language, signs, and symbol systems. The classical representation of an activity system is a mediating triangle comprising three central components, namely subject, object, and mediating artifacts (Vygotsky, 1978). Activities are social practices oriented at objects. An entity becomes an object of activity when it meets a human need. The subject constructs the object using mediating artifacts (Engeström, 1999b). Leont’ev (1978), drawing on Vygotsky’s foundational work, points out that there is a crucial difference between an individual action and a collective activity and extends Vygotsky’s original model into a model of a collective activity system. Leont’ev’s conceptualization includes division of labour, which helps to differentiate between what is accomplished collectively or individually. Leont’ev further adds a distinction between activity, action and operation, as three different levels of human practice in order to delineate an individual’s action from the collective activity (Leont’ev, 1978, Section 3.5). Inspired by Leont’ev’s work, Engeström (1987, 1999a) also notes that the problem with Vygotsky’s classical representation of an activity system is that it does not fully explicate the societal and collaborative nature of the human actions. He then graphically expands Vygotsky’s original mediating triangle with a social component by including three contextual factors, namely community, rules, and division of labor. Engeström uses this expanded activity system model as the basis for his theory of expansive learning, which focuses on the expansive transformation of the object of activity in a collective activity system (Engeström, 1987, 1999b). However, in the new knowledge intensive era, it is increasingly evident that knowledge is highly complex and that dealing with knowledge is definitely not reducible to any sequence of actions. The actions which form Engeström’s expansive learning cycle are not the only kinds of actions that must be mastered and performed in highly complex knowledge ecologies. LaaN does not postulate a predetermined sequence of actions; it rather enables a wide range of learner-driven actions that are neither predetermined nor predictable. In general, using Activity Theory as a framework for the analysis of activity in complex learning environments has a major limitation. Learning as a complex activity cannot be captured by an overarching activity system (or even a network of activity systems) purposefully oriented toward the achievement of an object of activity. Learning is multifaceted and dynamic, and activities in a learning environment are fuzzy, varied, and often fragmented, which makes it very hard to elicit a complete picture of the activity system(s) under observation, encompassing, in activity theory terms, an evolving set of subjects, objects, mediating artifacts, actions, rules, norms, and division of labour. The solution to this problem is to understand the learning activity from the learner’s point of view. Whereas in Activity Theory the prime unit of analysis is an artifact-mediated and object-oriented activity, LaaN rather focuses on the individual learner and her PKN. In activity theory, you are what you do. In LaaN, you are what your PKN is. Actor-network theory (ANT), also known as the sociology of translation or sociology of associations, proposes a socio-technical account that makes no distinction in approach between the social, the natural and the technological (Latour, 1996, 2005; Law, 1992). ANT is based upon the principle of generalized symmetry employing a single conceptual framework when interpreting actors, human and non-human. ANT has several limitations to be applied as a framework for dealing with complex learning environments. ANT explores the ways that heterogeneous networks of both human and non-human actors are constructed and maintained and focuses on tracing the transformation of these heterogeneous networks (Latour, 2005). Central to ANT is the concept of translation, which is the process of creation of an actor-network and generation of ordering effects Law (1992). The main problem of ANT’s heavy emphasis on the construction, maintenance and transformation of actor-networks (i.e. translation) is that it reduces all actors into black-boxes, and thus ignores internal actions which are crucial for the creation of PKNs, and hence learning, such as seeing patterns, reflecting, (self-)criticizing, and detecting/correcting errors. These actions build the cornerstones of LaaN. Treating non-human actors as mediators makes from them complex entities where cause and effect are intertwined and cannot be separated. Non-human actors, however, are rather complicated entities - or in Latour’s terms intermediaries. All the components of a non-human actor are knowable and cause and effect relationships can be predicted. In LaaN non-human "actors" are just an enabler. At the heart of LaaN lie individual learners and their PKNs. Latour (2005) uses the verb reassemble to describe the same effect. However, in the new knowledge intensive era, the relationship between different knowledge nodes or in Law’s terms ‘heterogeneous bits and pieces’ is becoming flexible and is changing rapidly; thus, it cannot be captured through a reconfiguration process. Reconfiguration, or in Latour’s terms reassembling, works well for complicated systems in which different components and associated relationships can be identified and managed. Reconfiguration, however, cannot work while dealing with complex knowledge systems comprising many interacting identities. In the latter case, networking is the solution. In complex knowledge systems, the way the knowledge nodes network with each other results in unpredictable movements in the knowledge ecology. Knowledge ecologies lie at the heart of LaaN. Furthermore, Latour (2005) claims that "it’s possible to render social connections traceable" (p. 16) and that the role of ANT is to trace actor-networks (p. 128). In complex knowledge systems, however, there is no chance to trace social connections, nor is it possible to follow the actors or their actions. Latour himself acknowledges that following the actors themselves is not an easy task since, as he writes, "the actors to be followed swarm in all directions like a bee’s nest disturbed by a wayward child" (p. 121). Thus, there is no means to trace actors’ actions and connections because their actions are uncertain, unexpected, and often hidden; and their connections are varied, ubiquitous, and open. The role of LaaN is neither to follow actors nor to trace their actions or connections. Its major role is to help learners build and nurture their PKNs and to foster connections between different PKNs in order to form a complex, adaptive, dynamic, open, and living entity; i.e. a knowledge ecology. 1. How does learning occur? 2. Which factors influence learning? 3. What is the role of memory? 5. What types of learning are best explained by the theory? Based on these definitive questions and other dimensions (i.e. focus, core activity, learner’s role, underlying social entity and its characteristics), Table 1 and Table 2 summarize how LaaN differs from the learning and social theories outlined in the previous sections. The stress here that different learning theories cannot be considered in isolation. They complement and enhance each other. They interplay with each other, but cannot replace each other. In fact, many the assumptions that underlie LaaN are compatible with those of other theories. LaaN is thus not a replacement for other theories that address different aspects of learning but rather that it has its own focus and explains specific types of learning. The primary focus of LaaN is mainly on the learner and her PKN and complex network learning is the type of learning best explained by LaaN. This paper introduced and discussed the Learning as a Network (LaaN) theory, which represents a theoretical framework for self-organized and networked learning models. LaaN builds upon connectivism, complexity theory, and double-loop learning. It views knowledge as a personal network and represents a knowledge ecological approach to learning. By comparing LaaN to influential learning and social theories, the aim was to better explore the scope of LaaN. As is obvious, LaaN has a number of points in common with other learning and social theories; mainly that knowledge and learning are inherently social. However, its focus on the learner and her PKN is quite distinctive. LaaN provides a theoretical foundation for self-organized and networked learning models, such as PLEs and cMOOCs. Argyris, C. (1991). Teaching smart people how to learn. Harward Business Re- view, 69(3), 99–110. Argyris, C., & Schön, D. A. (1978). Organizational Learning, A Theory of Action Perspective. Reading, Massachusetts: Addison-Wesley. Argyris, C., & Schön, D. A. (1996). Organizational Learning II: Theory, Method and Practice. Reading, Massachusetts: Addison-Wesley. Corning, P. A. (2002). The re-emergence of emergence: A venerable concept in search of a theory. Complexity, 7(6), 18–30. Engeström, Y. (1987). Learning by Expanding: An Activity - Theoretical Approach to Developmental Research. Helsinki: Orienta-Konsultit. Engeström, Y. (1999a). Activity theory and individual and social transformation. In Y. Engeström, R. Miettinen, & R. L. Punamäki (Eds.) Perspectives on activity theory, (pp. 19–38). Cambridge: Cambridge University Press. Engeström, Y. (1999b). Innovative learning in work teams: Analyzing cycles of knowledge creation in practice. In Y. Engeström, R. Miettinen, & R. L. Punamäki (Eds.) Perspectives on activity theory, (pp. 377–404). Cambridge: Cambridge University Press. Engeström, Y. (2001). Expansive learning at work: toward an activity theoretical reconceptualization. Journal of Education and Work, 14(1), 133 – 156. Ertmer, P. A., & Newby, T. J. (1993). Behaviorism, cognitivism, constructivism: Comparing critical features from an instructional design perspective. Performance Improvement Quarterly, 6(4), 50–72. Goldstein, J. (1999). Emergence as a construct: History and issues. Emergence: Complexity and Organization, 1(1), 49–72. Holland, J. H. (1992). Complex adaptive systems. Daedalus, 121(1), 17–30. Holland, J. H. (1995). Hidden Order: How Adaptation Builds Complexity. Reading: MA: Addison-Wesley. Holland, J. H. (1998). Emergence: From Chaos to Order. Reading, MA: Addison- Wesley. Jonassen, D. H. (1991). Objectivism versus constructivism: do we need a new philosophical paradigm? Educational Technology Research and Development, 39(3), 5–14. Lave, J., & Wenger, E. (1991). Situated Learning. Legitimate Peripheral Participation. New York: Cambridge University Press. Leont’ev, A. N. (1978). Activity, Consciousness, Personality. Englewood Cliffs, NJ: Prentice Hall. Lewes, G. H. (1875). Problems of Life and Mind. London: Truebner. Ryan, A. J. (2007). Emergence is coupled to scope, not level. Complexity, 13(2), 67–77. Schunk, D. H. (1991). Learning theories: An educational perspective. New York, NY: Merrill. Skinner, B. F. (1974). About Behaviourism. New York: knopf. Snowden, D. (2002). Complex acts of knowing: Paradox and descriptive self- awareness. Journal of Knowledge Managment, 6(2), 100–111. Vygotsky, L. S. (1978). Mind in Society: The Development of Higher Psycholog- ical Processes. Cambridge, MA: Harvard University Press.